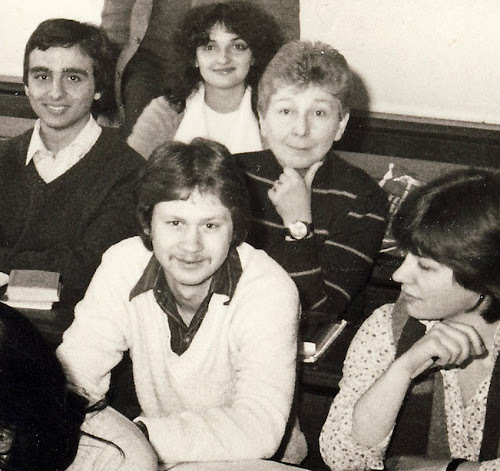 This one is from 1982 when I was a student at the Alliance Française in Paris. I was in the second semester of my French studies and the class was leading up to le degré supérieur. There are three Americans in this class, one of whom (Jane) was in our program. Our teacher was named Monsieur Grand. That's me in the white sweater. I was 22 years old. The woman next to me is German. I remember that he would start each class by calling on students randomly to conjugate a verb in a certain tense. They were always the hardest tenses, like the imperfect of the subjunctive or something similar. I was not very good at it. But he gave us hints to help us along, after thoroughly embarrassing us. Of course, we were only embarrassed in front of him. Nobody in the class wanted to be called on and we were never critical of each other. The whole class. 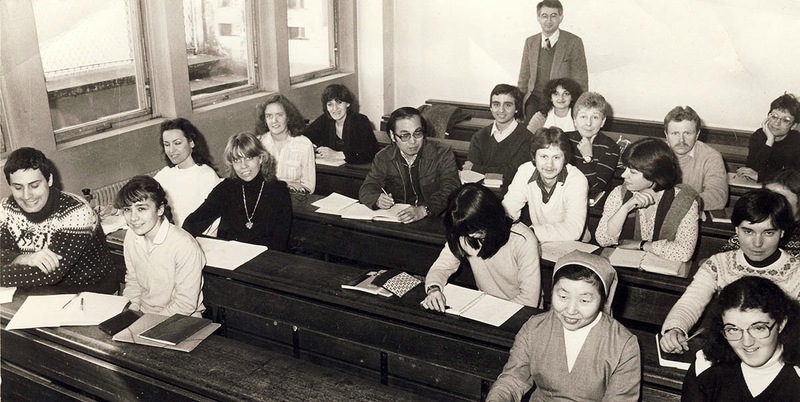 Our teacher, M. Grand, is standing in the back. Jane is in my row, to the left by the window. I passed the class and went on to the oral exams (very stressful) and got my certificat de français parlé and diplôme de langue française. Not much going on outdoors right now. A couple days of rain and cool temperatures have kept us inside. The garden is growing and there's not a lot of maintenance to do. Of course, there will be plenty to do when it warms up again. I've got to prepare for the arrival of this year's firewood. That means cleaning up under the carport where I cut and store the logs. There's also some outside trim and window sills we'd like to paint. 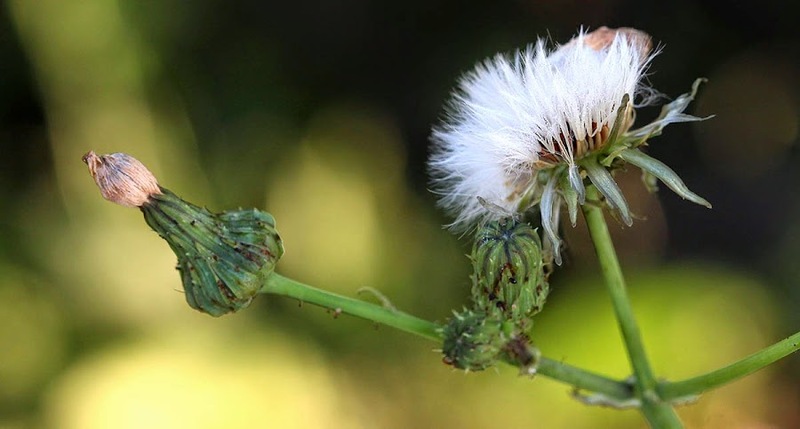 The grass (weeds) will need to be cut again in the next few days. The rising sun shines through the morning haze while Callie waits for me to take the picture. Callie gets her two daily walks, rain or shine. Ken took her out yesterday evening and came back with a bag full of little yellow plums. 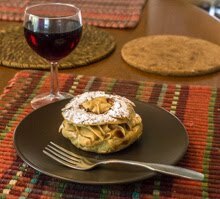 I think I'll make another tart. This is where we start our morning walks. Once we leave the back yard, through the garden gate, we start out into the vineyards on this dirt road. The direction at this point is roughly southwest, so the sun is rising at our backs. Most mornings I stick pretty much to the road because the tall grasses between the vines and the woods can be wet. On dry days we'll take detours around the vineyard parcels and sometimes cross over to the paved road to the north, then swing back around to the dirt road to come home. Sunrise this past Sunday morning. You can see Callie out in front, to the right of the road. December 2010. Can't you just feel the chill? The green beans in the vegetable garden are covered with beautiful lavender blossoms. In the past, my green bean plants have had white blossoms, so I must have picked up a different variety this year. 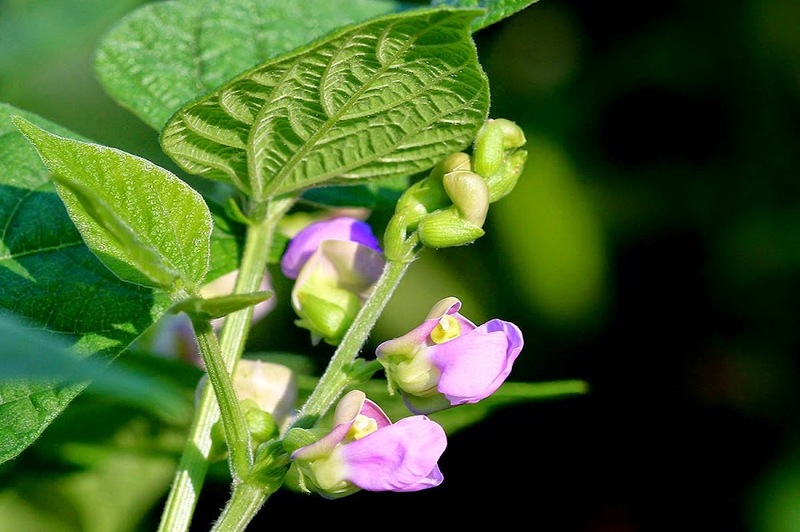 These are the dwarf beans; the climbing beans are just starting to form flowers and I don't know what color they are, yet. I'm looking forward to harvesting the first green beans. Last night's rain will be good for the plants. It also helped to replenish the water in the rain barrel. I had pretty much used it all up during this past week of hot weather. The new rain barrels we got this year are working well and I've been using a lot less town water in the garden. That is, if you don't count the radishes we harvested in the spring, and the coriander we've been picking for a while. These are the first fruits! 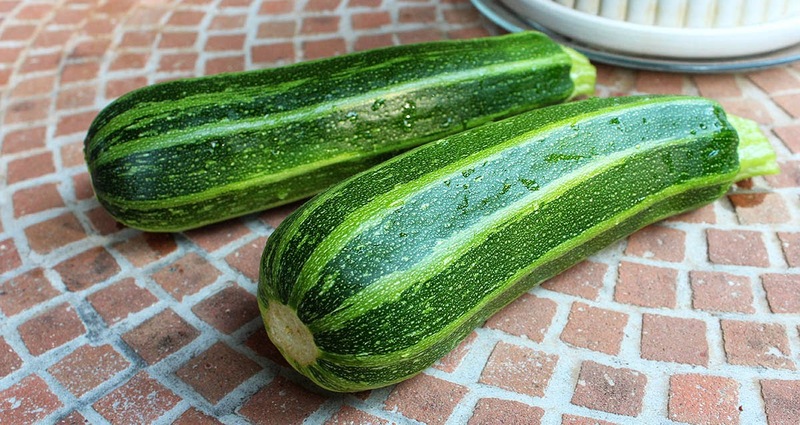 The courgettes (zucchini) are starting to produce. We plan to stuff these with the beef and rice filling that was left over from making dolmas not long ago. It won't be long before we have green beans and tomatoes, too. At least I hope it won't be long. I'm looking forward to August. I'm seeing a lot of tendrils now. This one is a grape vine. 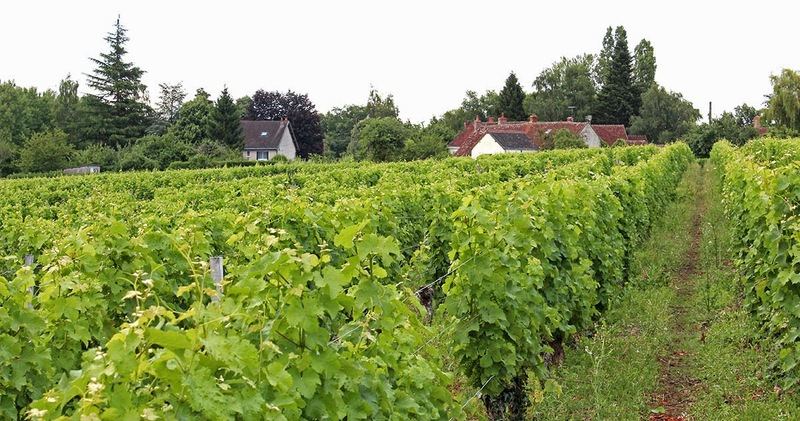 The vines send out tendrils that grasp and climb the horizontal support wires strung along the vineyard rows. A few times during the growing season, the growers will drive tractors fitted with spinning blades that cut off branches on the sides and the tops of the vines, making very neat, uniform rows. The grape bunches are safely nestled in the interior of the plant where the blades can't reach. 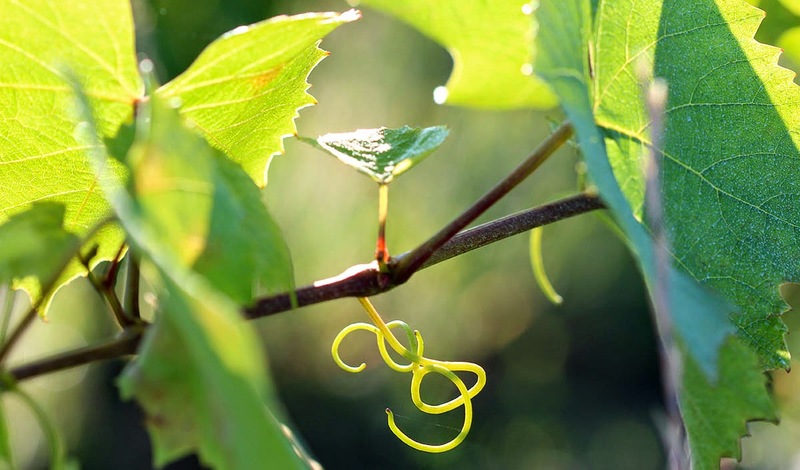 A grape tendril that hasn't found a gripping point. There are also many tendrils in our vegetable garden. The green beans, climbing beans, winter squash, and cucumbers all send out tendrils to grip and climb. I will soon need to clip off the ends of the winter squash to keep the plants from wandering too far outside the garden beds and encourage their fruit to grow. The weather people got it right: this week has been a hot one. Well, hot for us. Even so, we've been using the oven to make pizzas and calzone. On Thursday I made some ice cream with the raspberries we picked back in June. I had frozen half of them; raspberries freeze incredibly well. The recipe was easy because it didn't require making a custard. The result was delicious. Not much else going on right now. We're taking it easy, resting after what was (for us) a hectic social calendar over the past month or so. The Tour de France will be finishing up this weekend with the traditional final ride into Paris on Sunday, so I'll be watching that on television. I haven't run out of old photos. Yet. This one is, I think, from 1963. The actual photograph is stamped "Dec 63," but that doesn't look like it would December in upstate New York. So, maybe it's from the fall. 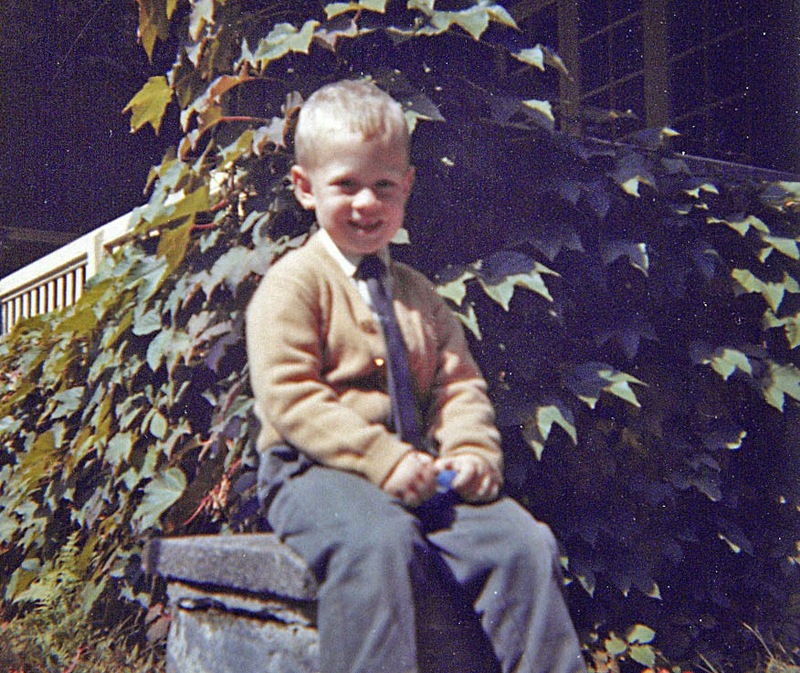 I would have been three, almost four, years old. If I remember correctly, my parents rented the upstairs apartment in this building where we lived in 1963. I have some other photos from this group (same date stamp) with snow in them which makes me think that this roll of film was developed in December of that year. I remember, of course, back in the film days how a single roll of film could sit in a camera for months before it was developed. That's all ancient history, now. The vegetable garden is progressing. We have lots of little green tomatoes, some zucchini and winter squash are forming, and one row of green beans is forming blossoms. The corn is not very tall (I'm not sure how tall this variety is supposed to get) but I can see tassels starting to form. 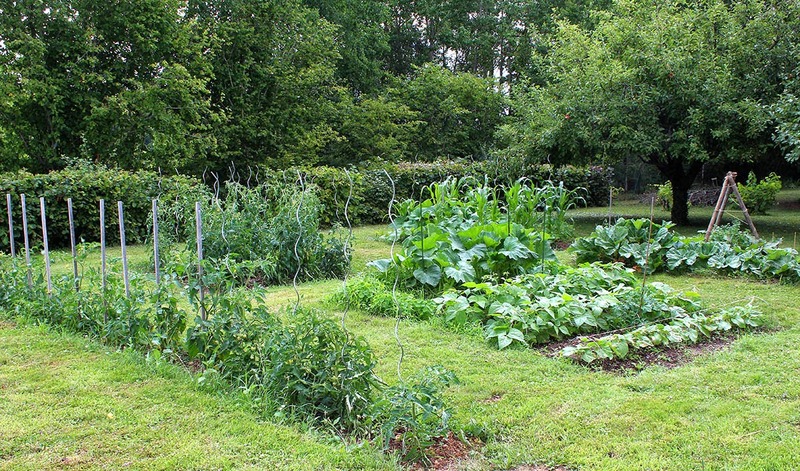 A wide view of the four square garden plus the long strip of tomatoes (on the left). We have 32 tomato plants in all, plus 2 volunteers. The cucumbers have sent out tendrils and I'm training them up the tee-pee like structure you see in the pictures. That's the "cucumber tree." Under it is a crop of coriander (cilantro) that's getting ready to go to seed. We use the coriander leaves (called cilantro in the US) in Asian and Mexican dishes and we also use the seeds in other cooking. Plus, the seeds can be planted again next year (there are always too many to use). Another angle. You can see the corn sticking up in the back. Otherwise, the surviving aubergine (eggplant) plants are looking good and the warm weather has given a boost to the scrawny bell peppers. Time will tell if they will produce anything. So that's the state of the garden as we move toward August. 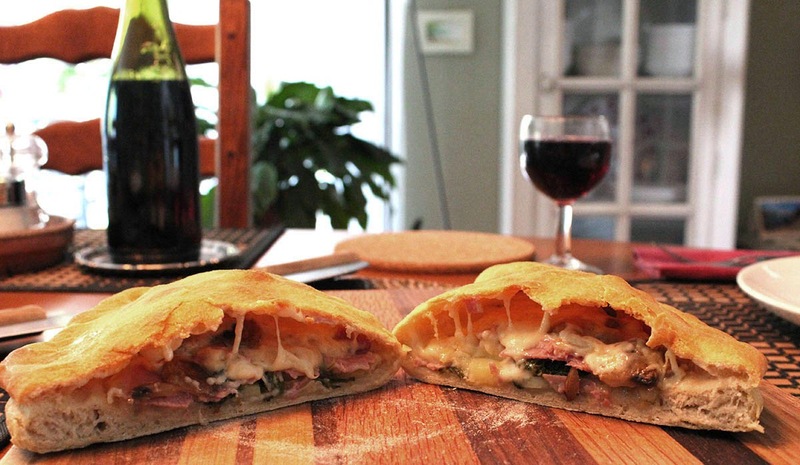 For lack of a better topic, I'll show you the calzone Ken and I made for Sunday's lunch. We used leftover pizza dough and layered half of it with steamed potatoes, two types of ham, some leftover chopped celery greens, and cheese. Then I folded the dough over the stuffing and crimped it closed. It went into the oven for twenty or thirty minutes. A hot pocket of goodness. We each ate half, which was plenty. Between the dough and the potatoes, it made for a very hearty dish. Besides, we had eaten celery and carrot sticks with a ranch-style dressing as an appetizer. Salad came after. Yesterday, we ate yet another smoked chicken and bell pepper pizza for lunch. And there is still enough dough left over for two more pizzas. I put that in the freezer for another time. Like a big pizza pie. I'm very bad at taking photos when we have guests. I guess I'm having too much fun to get the camera out. During our pizza party on Saturday I did manage one photo of the first pie out of the oven. 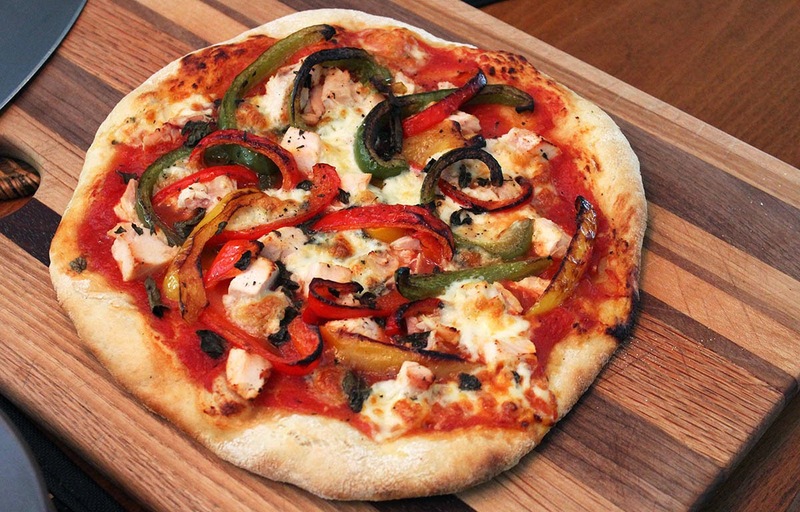 It's made with smoked chicken, sauteed bell peppers, tomato sauce, and mozzarella cheese. It's based on a Wolfgang Puck pizza I used to get at Macy's Cellar when we lived in San Francisco. Green, yellow, and red bell peppers make a colorful pizza. I made two of those during the afternoon along with one ham, cheese, and mushroom pizza and two pies with chorizo and onions, one with mozzarella and the other with emmental. The oven lock incident happened just as I was getting the second pizza ready, but with J. 's help, we got that under control and it didn't happen again. I made the dough the day before, but because the weather was so hot it became a sticky, gooey mess. We added a bunch more flour to it and it came back to life and worked great. There was dough left over along with some of the toppings we prepared, so Ken and I made a calzone for Sunday's lunch. We'll probably have another pizza for lunch today. So this will be the last of the photos that I took back at the end of June when we visited friends in Varennes-sur-Fouzon. Those friends will be leaving their vacation home soon for a few days in Paris before heading back to the USA. 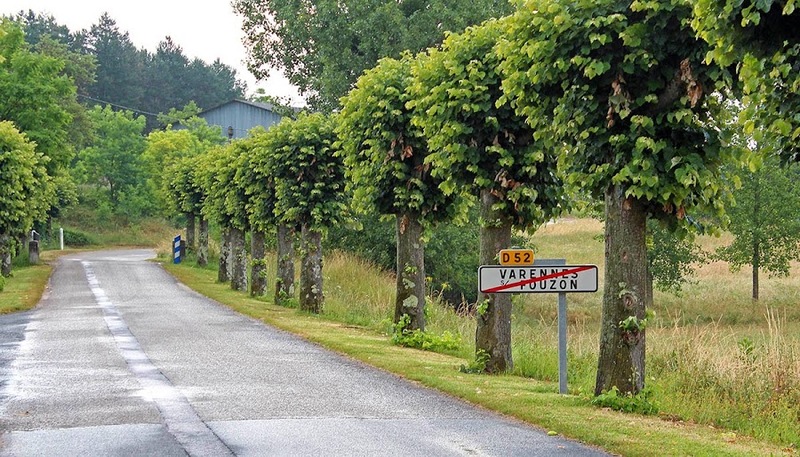 The sign as you leave Varennes-sur-Fouzon. They came to spend the afternoon at our place yesterday and we made pizzas for lunch. I got a little panicky when the oven locked up. I had the temperature up high and the pizza stone got very hot. Apparently the oven thought it was in a cleaning cycle and locked itself. We had to trip the circuit breaker to turn it off and let it cool so that it would unlock itself. It did, and we continued along without further incident. In all, I think we made five pizzas during the course of the day. And while the weather was hot, it didn't rain until later in the evening and we got to be out on the deck the whole time. What fun! I remember when I was a kid, and the summer weather sweltered, we would hook up the lawn sprinkler and play in the spray to cool off. 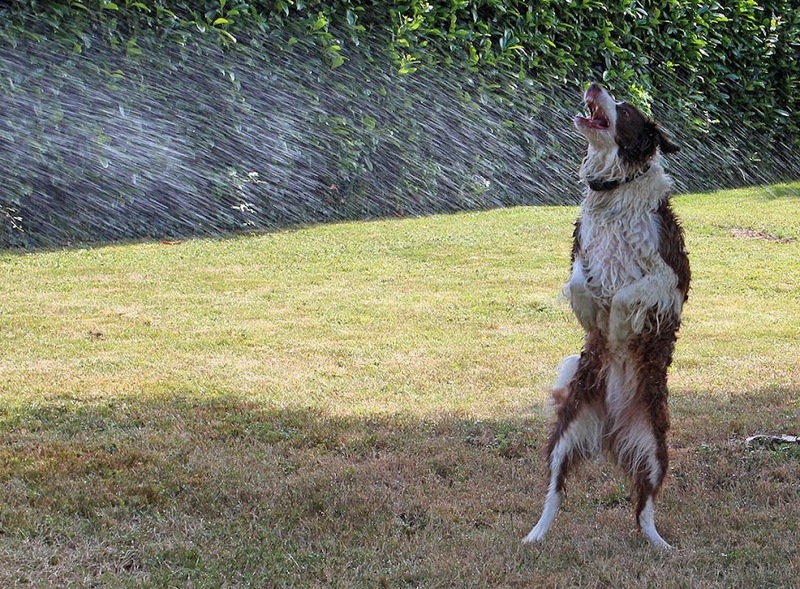 In what's becoming an annual tradition, Callie had her "play in the spray" yesterday. 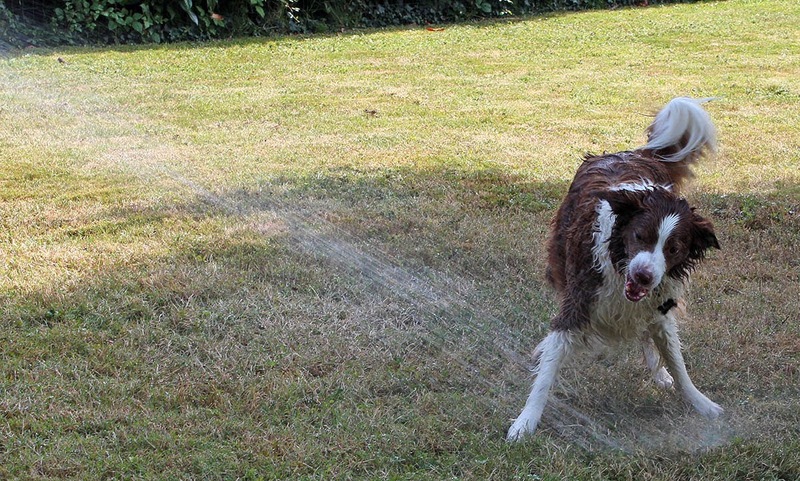 Callie snaps at the stream of water as Ken sprays her. 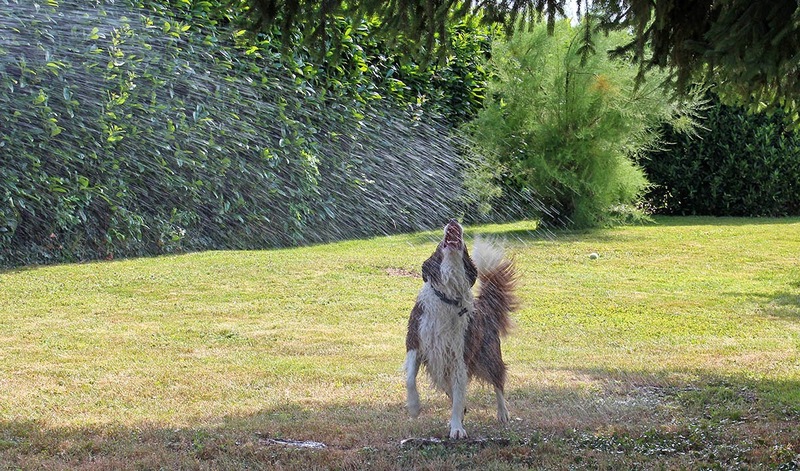 She has always been nuts about water spraying out of the hose, barking and snapping at it. So much so that if we're using the hose (watering the garden or washing the car), Callie has to be locked inside. So when she actually gets to play, she lets loose with wild abandon. It doesn't matter where the water is, she's gonna get a mouthful. She has a lot of fun and gets soaked. In the hot weather, it doesn't take long for her to dry. Summer's far from over, so there may be another spray day in the near future. After that cold and rainy week (or more) earlier this month, we're finally in summer mode. It's been hot. The vegetable garden is doing well. I'm keeping my fingers crossed that we don't have heavy thunderstorms with hail that could destroy the crop. Not to mention what that could do to the grape growers. 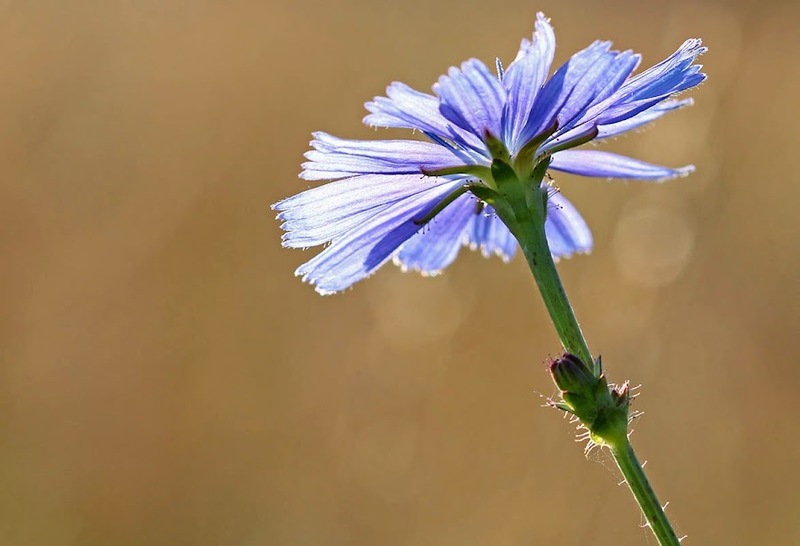 A sign that summer is in full swing: the wild chicory is blooming all over. We're supposed to have a stormy weekend (that is, thunderstorms in the evenings or overnight), then a calmer period with more seasonable temperatures and dry days through next week. That will be nice. Sherman, set the WABAC machine to 1971. 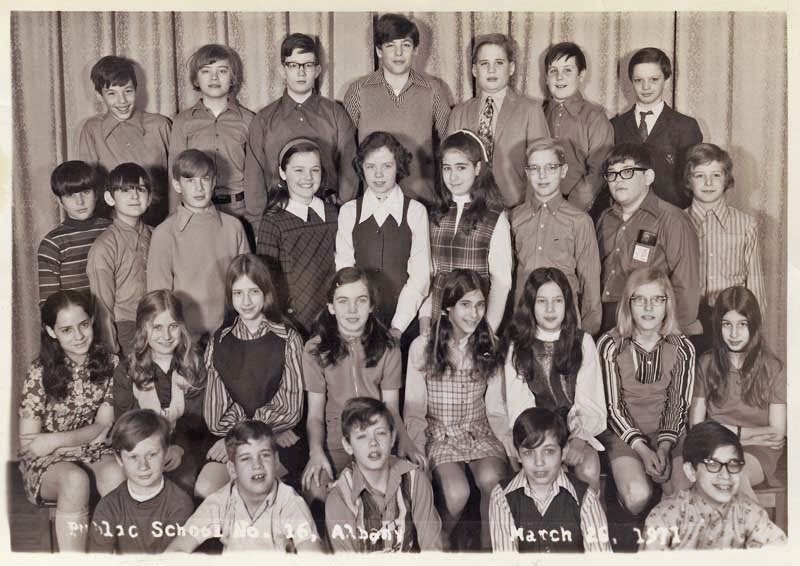 Here I am in the sixth grade class photo at P.S. 16 in Albany. I was sitting on the floor to the far left in the first row with four other boys. We were the short guys. Behind us, eight girls were seated. Standing (of course) behind the girls were two rows of the taller kids (three girls and thirteen boys). This is the year I started taking French in school. I was a year behind because I had just moved into the city school district in fifth grade, then placed into an "advanced" class for sixth grade. The "advanced" kids had started French the year before. I had some catching up to do and one of the kids was assigned to tutor me in French. 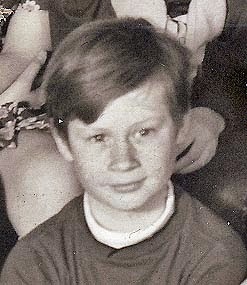 We would meet on the school steps in the morning before class started and he'd run the alphabet and numbers with me. The whole class. My French tutor is the kid in dark-rimmed glasses with the glasses case in his shirt pocket. I'm impressed by how the photographer set this up more or less symmetrically. Boys and girls are grouped, not random, by height, and to the extent possible by hair color and style. For example, the two seated girls in the middle each have their long hair tied in tails. And the two long-haired girls behind them, on either side of a curly-haired girl, are each wearing a headband. 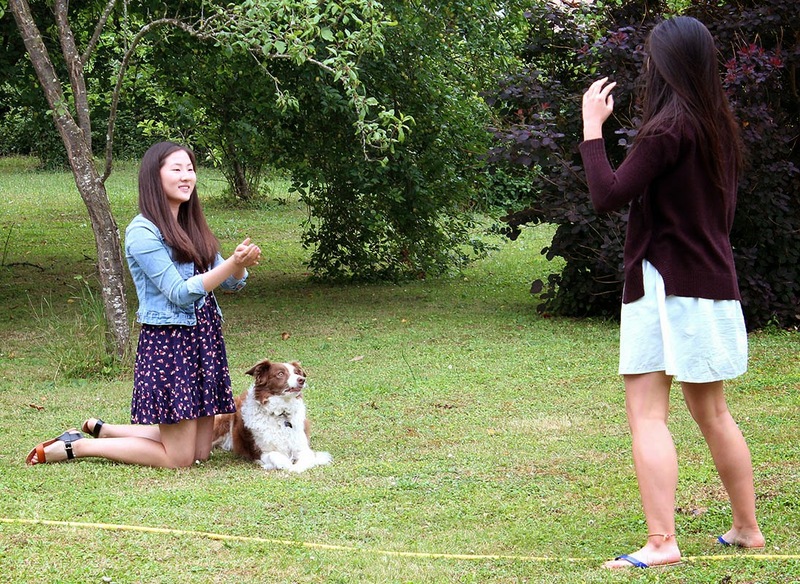 I don't remember the photo session and I'm sure we weren't aware of what the photographer was doing. As usual, I don't know what kind of bug* this is. But I thought it was pretty sitting on a Queen Anne's lace flower head in the morning sun. Our weather has veered back to summer-like and I'm enjoying afternoons on the deck again. 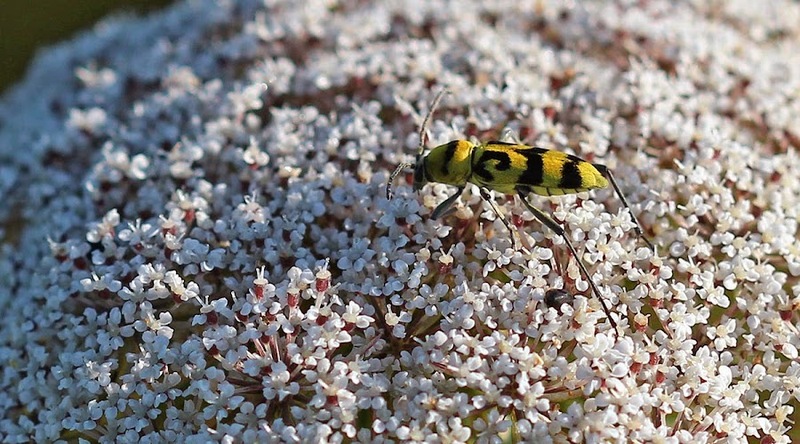 *UPDATE: It may be chlorophorus varius. A pretty yellow and black insect sunning itself on Tuesday morning. If we're lucky, we'll still have another month or two of summer-like weather. 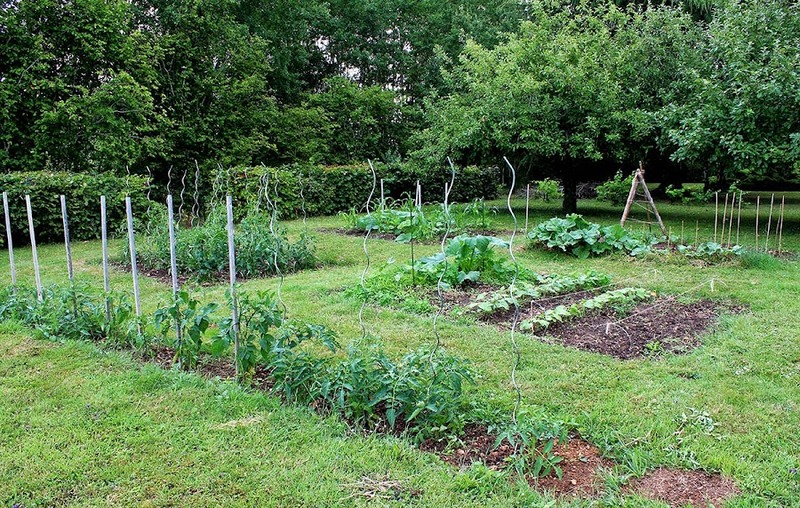 The vegetable garden is looking good. All the rain we had has really helped the plants grow, and now warm weather will spur them on. Go 'Maters! 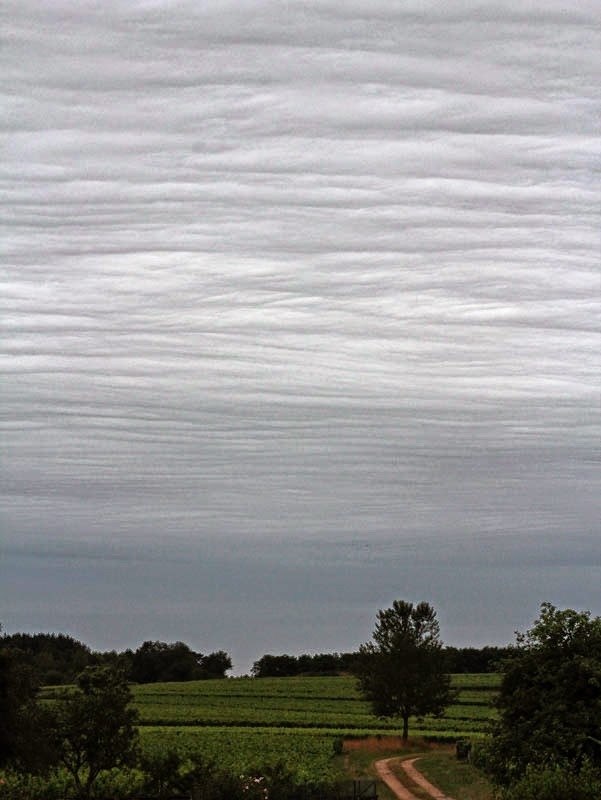 Here's another photo from Varennes-sur-Fouzon. It was just over two weeks ago now that we were there. I took these pictures while taking Callie for a walk in the morning (we spent the night there). There is a long avenue that leads from the center of town out toward the train station, hence its name (Train Station Avenue). The train station is all the way to the end of the avenue, then off to the right, outside the picture. It would have been nicer had the weather cooperated. Since it was chilly and showery, we had to eat indoors rather than out on the deck. Oh well. 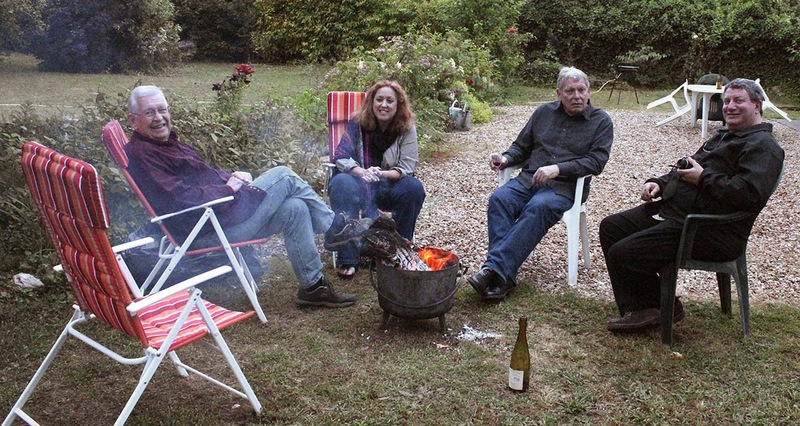 We welcomed a couple of friends for lunch on Sunday and had a good time in spite of the weather. The fixin's for kir, minus the sparking wine which was chilling in the fridge. 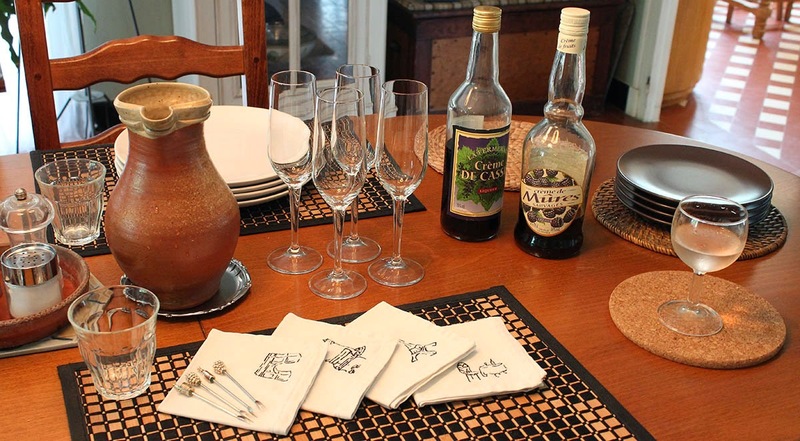 We had appetizers of saucisson sec (mild dried sausage), olives, and rillettes de porc et de canard sur toasts (potted pork and duck on toast) along with a bottle of champagne, then kirs made with a sparkling Vouvray and blackberry liqueur. Nibbles. 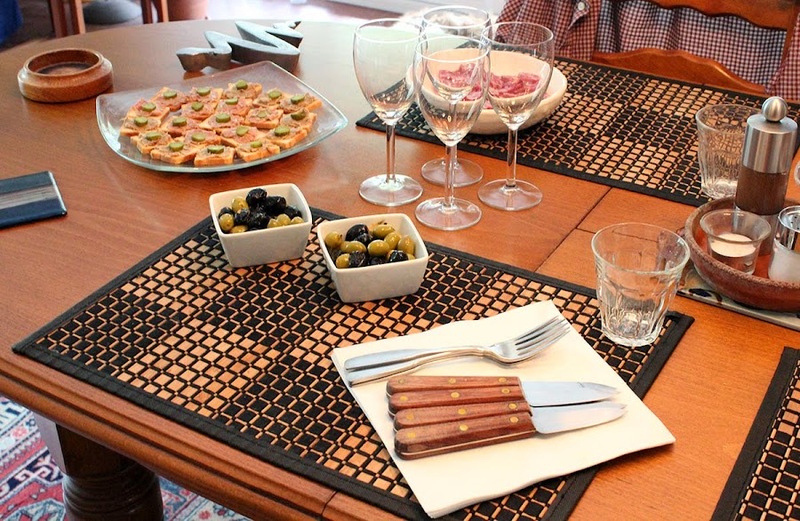 The sliced sausage is hiding behind the wine glasses. The first course was a salad of céleri rémoulade (grated celery root in a mayonnaise/mustard sauce) topped with saumon fumé (smoked salmon) and served with a chiffonnade de salade (shredded lettuce), tomates cerise (cherry tomatoes), and a single olive noire (black olive). That was accompanied by a local dry rosé made from pineau d'aunis grapes. 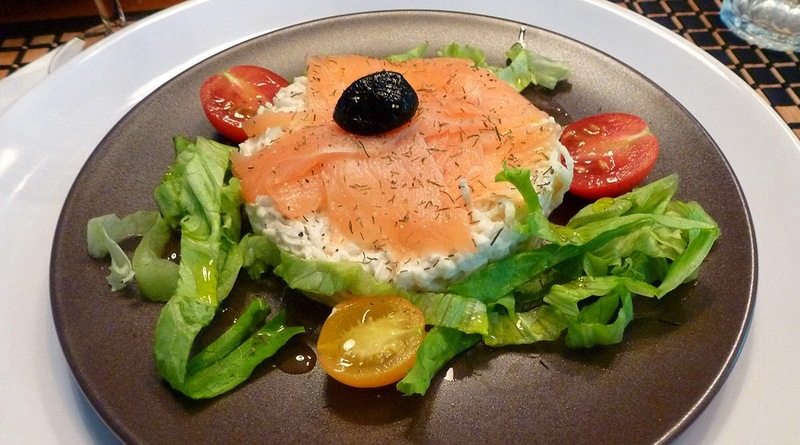 Salade de céleri rémoulade et du saumon fumé. Ken took this picture. By the time we got to the main course we forgot all about taking pictures. Ken roasted a pintade (guinea hen) stuffed with sauge (sage from our garden) on the rotisserie and served it with pommes de terre rôties (oven roasted potatoes) and kale. The wines were two local reds; a côt (malbec) and a "tradition" (a blend of côt and cabernet). We finished off with a plateau de fromages (cheese board) and a delicious cobbler of plums and apples that our guests brought along. Yum! Here's a view of our house, peeking out from behind the trees in our yard. I was out in the vineyard with Callie, of course, on a recent afternoon walk. There are so many choices for paths to walk, and I make my choice as a function of the weather and how wet or dry the paths might be. Our house on the left, peeking out from behind the trees. Today is supposed to be wet. But after today, the weather is supposed to turn back toward summer. We shall see. Not only are the days dark, but it's cold, too. Not at all like July. C'est la grogne. People are complaining, especially people who have gone to the beaches in the north where it's cold and rainy. We're supposed to be coming out of this, but they say it will be slow. On Tuesday we're expecting the air flow to shift back to the south which will bring us much warmer temperatures. Nice weather for a barbeque, n'est-ce pas? Meanwhile, the garden is getting good and watered. Now the plants would appreciate some warm sunshine. Me, too. Last year, one of the vineyard parcels out back was ripped up. The vines were, apparently, suffering from some kind of fungus that could not be treated. Out they came, and the field was left fallow over the winter. Since then, it's been plowed a few times to keep the weeds down. Last week, after another plowing, new vines were planted. I didn't have my camera while they were planting, but I got a photo of the finished vineyard later. The new vines are about a foot tall and were set into forty or so rows by a machine that was pulled by a tractor. I saw two women on the back of the tractor setting the small vines into the machine while it was driven slowly up and down the rows. The grower and a few more people were out walking behind, I assume to ensure that each new vine plant was properly set. They also had some kind of solar powered contraption that I'm guessing was a GPS to guide the placement and spacing of the vines. The result is a new vineyard parcel that will be producing grapes in a few years. Go west, young man. 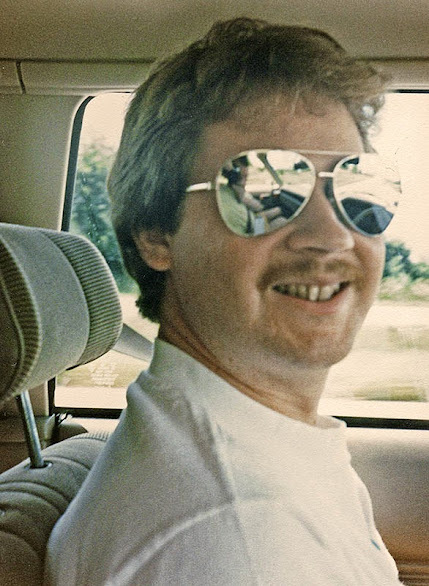 Here I am in the car, driving my little Subaru to California in 1986. Ken took the picture from the passenger seat. Those mirror glasses are hilarious. They weren't mine. Somebody had left them behind at a rest stop on the interstate. I found them and took them for the trip. Those glasses were really too big for me. If you look close, you can see Ken in the reflection. I think we were somewhere in Illinois at this point, judging from where the picture is in the album. We spent a night or two with our friends Tom and Harriet in Champaign-Urbana before heading up to Iowa and on through Nebraska, Wyoming, Utah, and Nevada before arriving in California. What a trip! 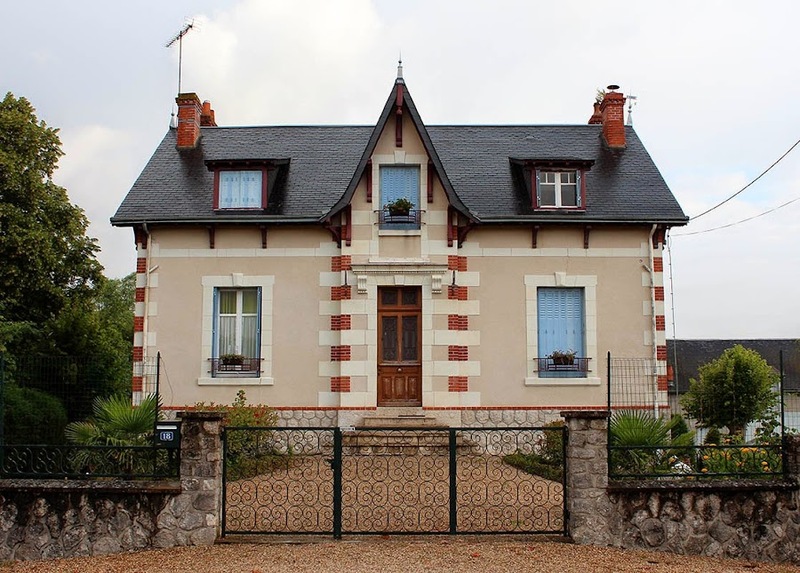 I walked through a very pretty neighborhood that morning in Varennes-sur-Fouzon. We were having rain showers off and on the previous night and all the streets were wet, like in a movie. 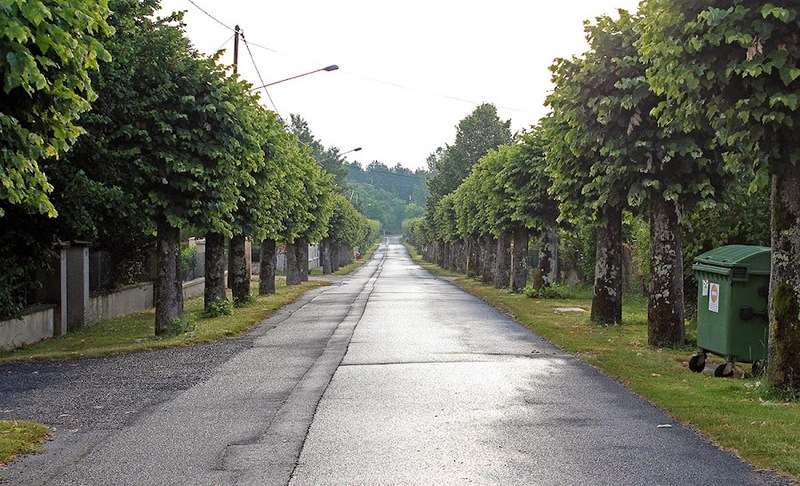 One long, tree-lined avenue was especially nice with pretty, well-kept houses on either side. I think this is the last house on the avenue before the town line. Blue shutters are very common. Ours are brown. I especially like the iron window boxes (click on the photo to make it larger). Behind the house were a couple of small out-buildings and the property extended to the right in this photo where there was a good-sized vegetable garden. The vegetable garden is looking better and better. After a slow start this year, with a few seed failures, we seem to be back on track. The tomatoes are doing very well and we even have some fruit now. Let's hope for more warm weather; that will really help them along. The "three sisters" garden plot is coming along, too. Some of the corn seeds failed, but I replanted and the corn is growing. 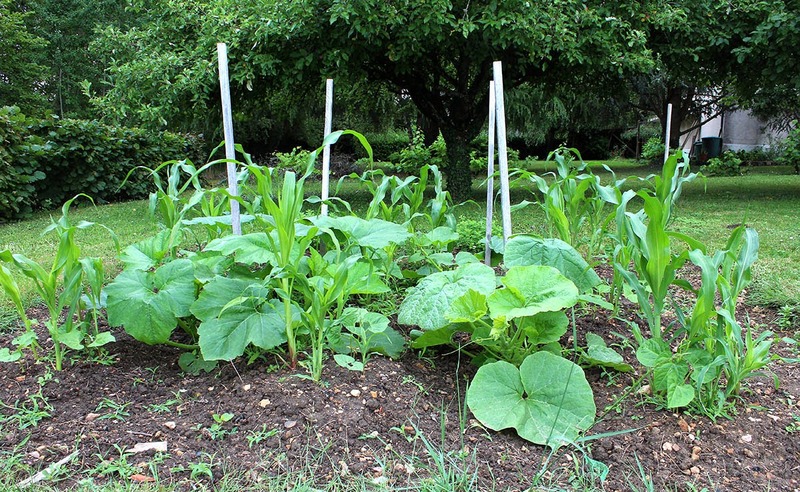 The winter squash I planted among the corn is doing fine, and now the climbing beans are coming up. I just hope the beans don't overtake the corn and pull it down. I'll have to take steps if that happens. 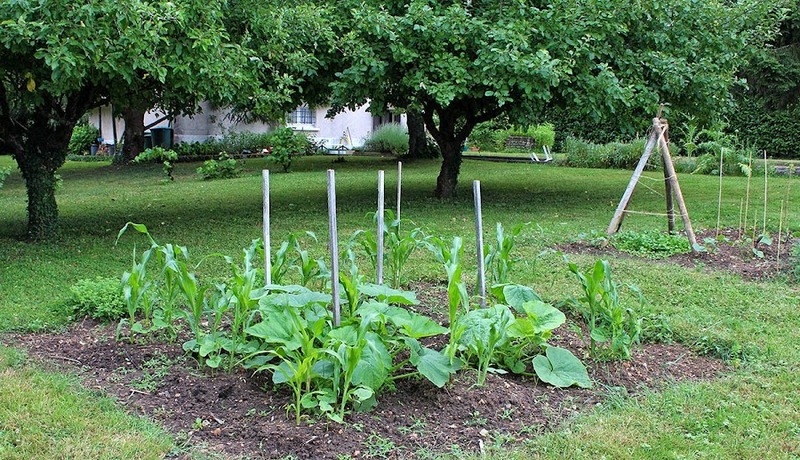 Corn, beans, and squash. The "three sisters" garden. Otherwise, it looks like a good year for green beans. The slugs didn't chop the new sprouts down, so I have three good rows of beans. I planted the rows a week apart so that we'll have successive crops. We haven't had green beans in a couple of years, so I'm looking forward to the harvest. A close up of the "three sisters" garden. The corn is as high as a puppy dog's eye. Maybe even higher. The bell peppers don't seem to be doing very well. And the eggplant is getting a late start, but now it looks like it's taking off. I'm hopeful. All will depend on the weather, as usual. Still in Varennes-sur-Fouzon, this is a view of town from just outside to the north. The fields of grain give way to buildings with the church just about in the center. 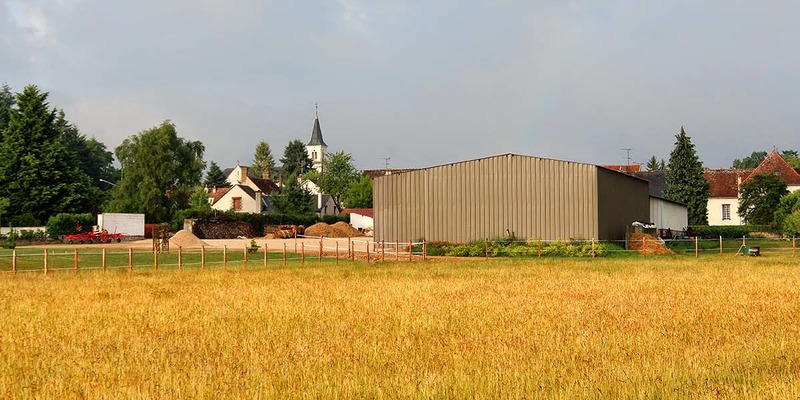 French towns don't sprawl to the extent that American towns do. They are compact and very city-like at the center and there are very few buildings outside the town line. Standing outside of town, looking in. We're now in a period of cooler, wetter weather. Just in time, too, because summer vacation just began. Ugh! I'll bet this place was full on Friday night. Full of people watching France lose to Germany in the World Cup quarter final. Lots of dejected fans, I'm sure. At least we won't have to watch the face-painted crazies singing la Marseillaise on television any more. For now. 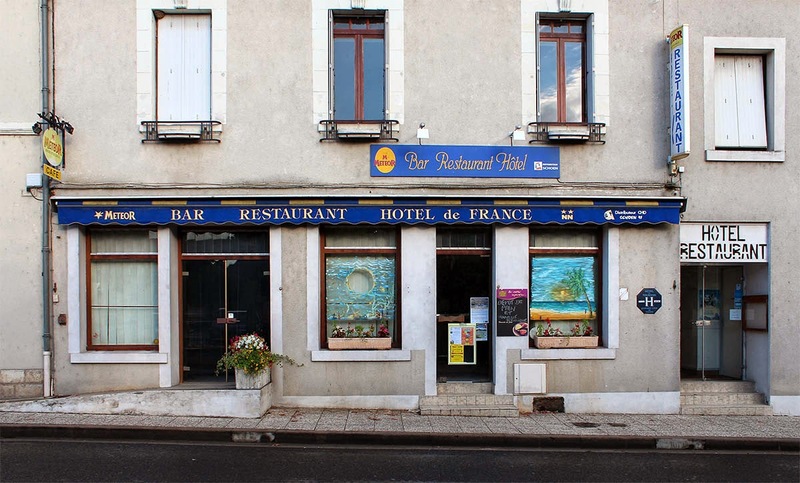 Hotel de France, Varennes-sur-Fouzon. All closed up on a Sunday morning. The Tour de France started on Saturday. I watched some of it while alternating with the women's tennis final in Wimbledon. It wasn't a very exciting match and it was pretty one-sided. And the bicycle race was (and will be today and Monday) in England. Pretty pictures. On Tuesday they get to France. No, not America. France. 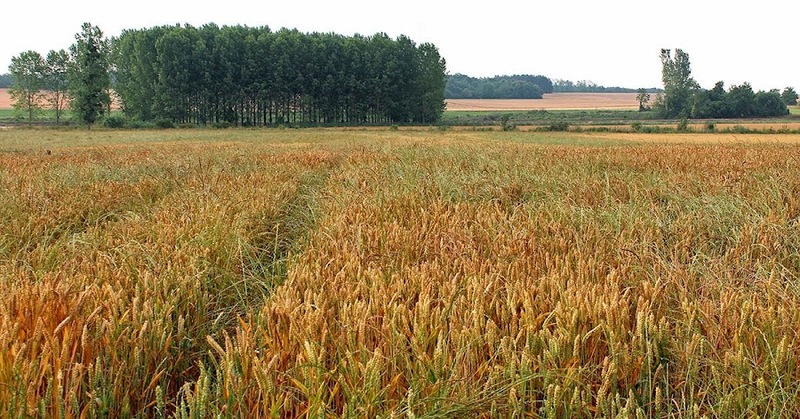 The wheat and other farmed grasses around us are looking to be very close to harvest time. In fact, I have seen hay bales popping up here and there already. On Friday we drove to a restaurant about a half-hour from home and passed many a golden wheat field. I'm not at all sure this is wheat. It doesn't look like the wheat fields I saw on Friday. This field is just outside the town of Varennes-sur-Fouzon where we had lunch last weekend. I took the picture during my morning walk with Callie at around 7:30 in the morning. 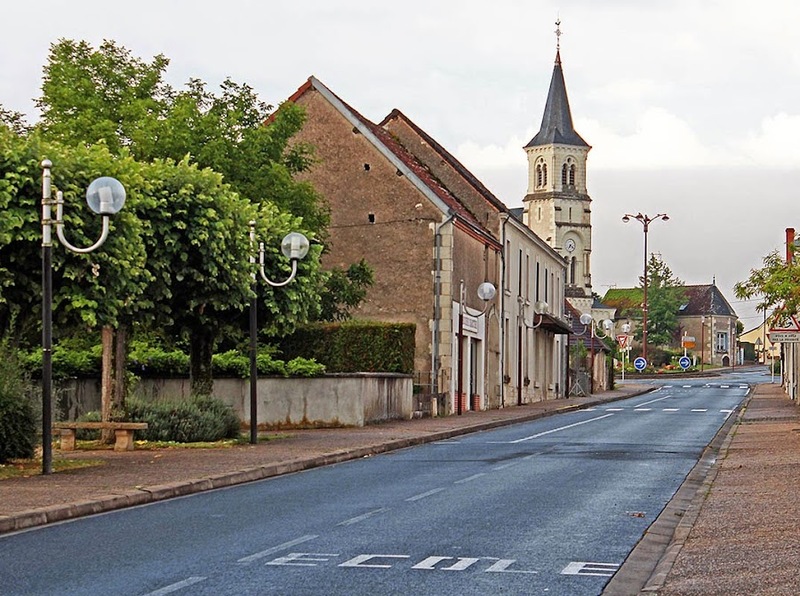 Like most French towns, the center of Varennes-sur-Fouzon is clustered around a church, a vestige of the power of the Pope and the Roman Catholic institution in the middle ages. I'm often amazed at just how monumental these churches are, especially in small towns of no more than a thousand people. The church is built in the romanesque style (pre-gothic), but the current building dates from the late 19th century. Almost new! I didn't go inside this particular church, but I've been inside enough of them to know that it's probably very well maintained, and likely still used, if not for weekly masses, then for weddings and funerals and services on the high Catholic holidays. Baby you can drive my car. Oh yeah. 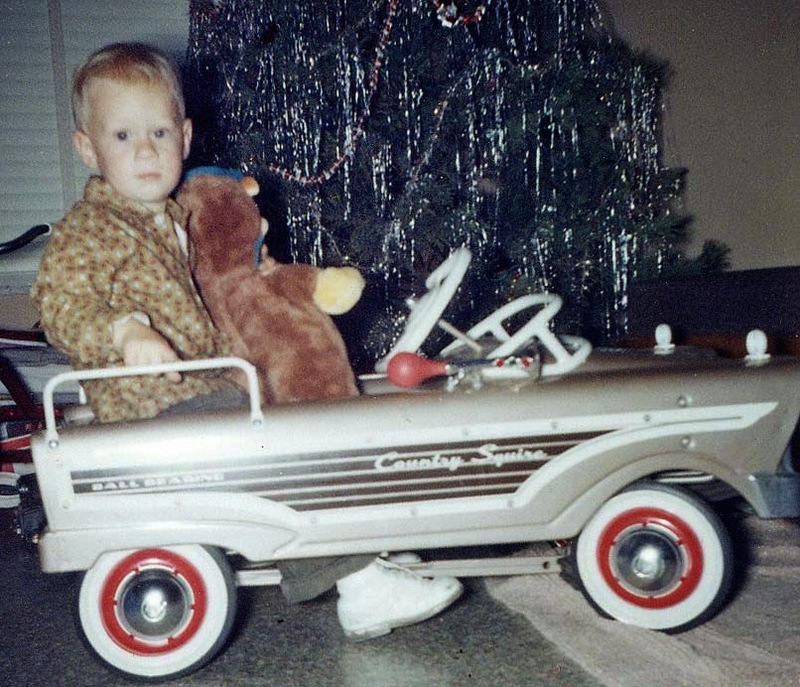 I'm not really sure if I remember this, but apparently I was groomed to drive a wood-paneled wagon. While clutching Yogi Bear. This was taken at Christmas in 1961. I was two years old then. I looked like a deer in headlights. Get a load of that horn. Honk! Our friends who are staying in Varennes have two twin daughters, H. and R., who really enjoyed meeting Callie four years ago when we saw them last. So they were excited to get to see her again on Saturday. Callie likes nothing better than to play with a tennis ball and, even though I totally forgot to take one along, J. found one in their rental house. 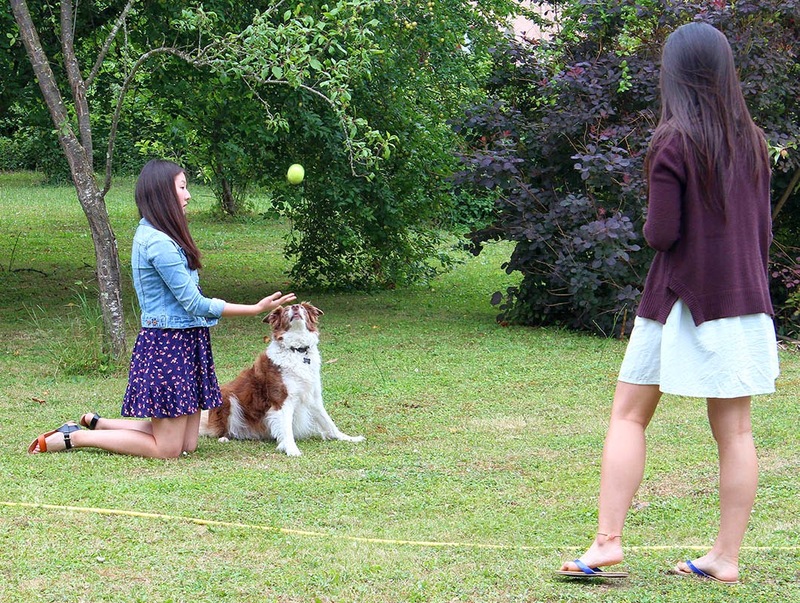 Callie never takes her eyes off the ball. Callie has an odd way of playing ball. When you throw the ball, she chases it down very excitedly, but then sits and waits for you to come and get it. I've managed to get her to bring the ball back, but only with a lot of coaxing. 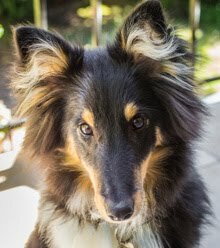 Sheep dogs are good at chasing, but they're not retrievers. Of course, good training could make the difference, but I'm not a good trainer. The instant after I snapped this one, Callie was up in the air to catch the ball that H. had just tossed. So here we are, deep into the evening on Saturday. It must have been near ten o'clock, when it starts to get dark this time of year. There were rain showers on and off all afternoon, but with enough dry spells that we could enjoy being outside. The fire really helped. From left to right: Ken, L., S., and J. I was taking the photo. That's my chair on the left. You can see the empty bottle on the ground. But after I took the photo, I also noticed another "empty" on the table in the background. Just so you know, we did not actually sing "Kumbaya." At least, I don't remember if we did.